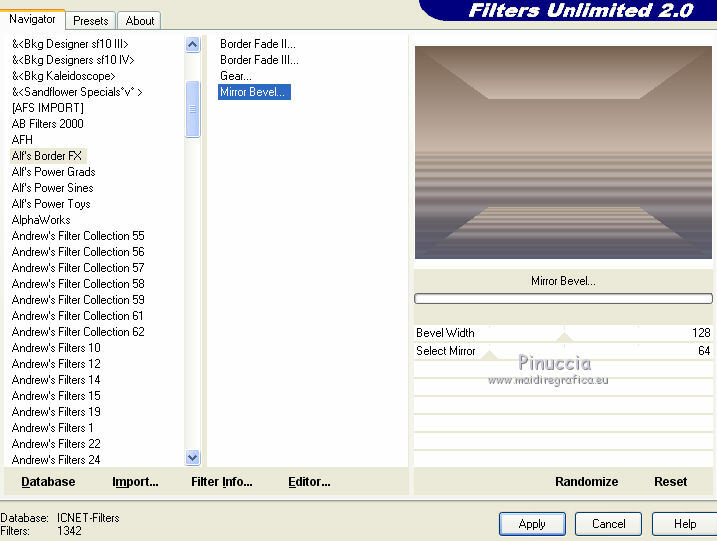 Filters VM Natural and Alf's Border FX can be used alone or imported into Filters Unlimited. 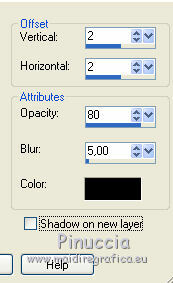 In the newer versions of PSP you don't find the foreground/background gradient or Corel_06_029. You can use gradients of previous versions here. and the background color to #755f51. 3. 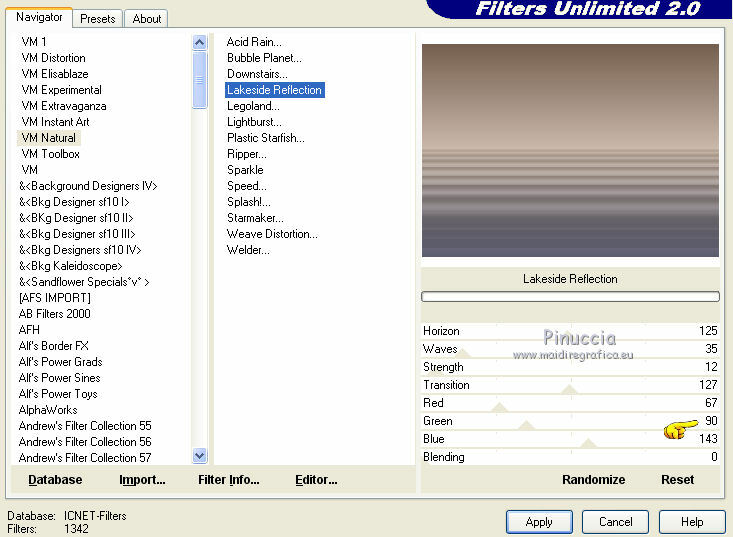 Effects>Plugins>Filters Unlimited 2.0 - VM Natural - Lakeside Reflection. 5. 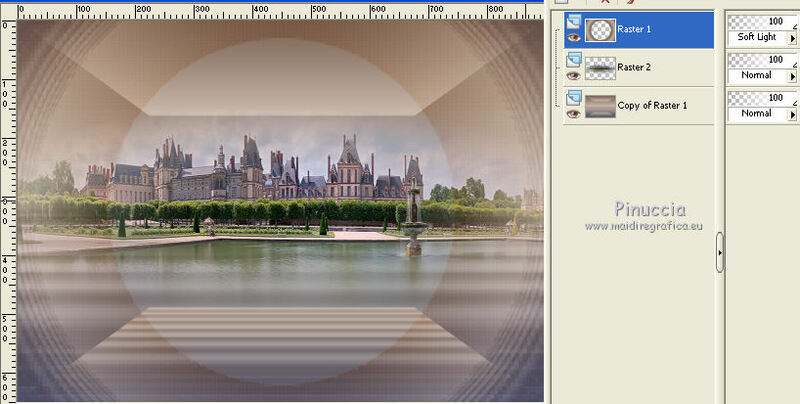 Effects>Plugins>Filters Unlimited 2.0 - Alf's Border FX - Mirror Bevel, default settings. 6. Open the tube lunapaisagem5173 - Edit>Copy. 7. Activate the layer Raster 1. 8. Effects>Plugins>Mura's Meister - Pole Transform. 11. 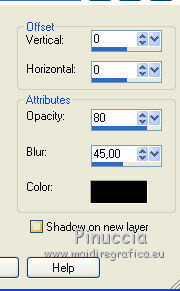 Change the blend mode of this layer to Soft light. 13. Image>Add borders, 1 pixel, symmetric, background color #755f51. Image>Add borders, 10 pixels, symmetric, color white. 15. Flood Fill the selection with the gradient. color gap: foreground color #cdbbad. 17. Image>Add borders, 1 pixel, symmetric, background color #755f51. 18. 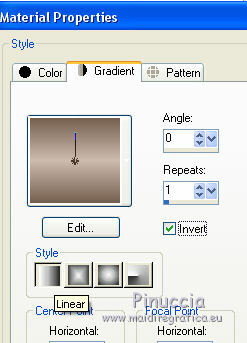 Clic on the white bord with Magic Wand tool to select it. 19. 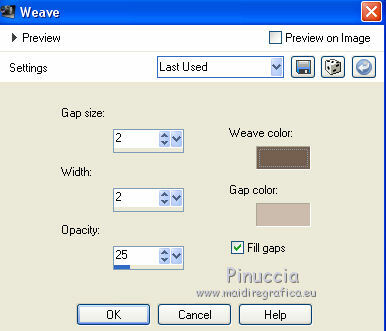 Effects>Textile Effects>Weave, same settings. Bi-Color Filter - to the right Color set: Cool/Warm 4. 22. Effects>3D Effects>Drop Shadow, color black. 24. Effects>3D Effects>Buttonize, color #3a4130. 25. Open the tube NaraPamplona 1514, - Edit>Copy. 27. Open the text Sensualite - Edit>Copy.